William Merritt Chase (1849–1916), Roland Dana Chase (1905), oil on canvas, 106.7 x 96.5 cm, Private collection. The Athenaeum. 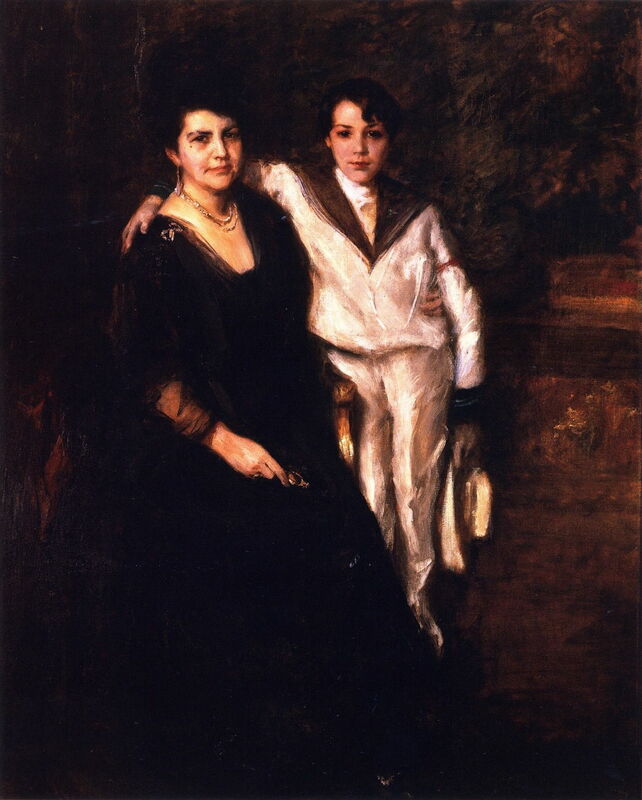 Having seen the family of William Merritt Chase (1849–1916) at leisure and play, this article shows a selection of the many portraits which he painted of his wife and their children. 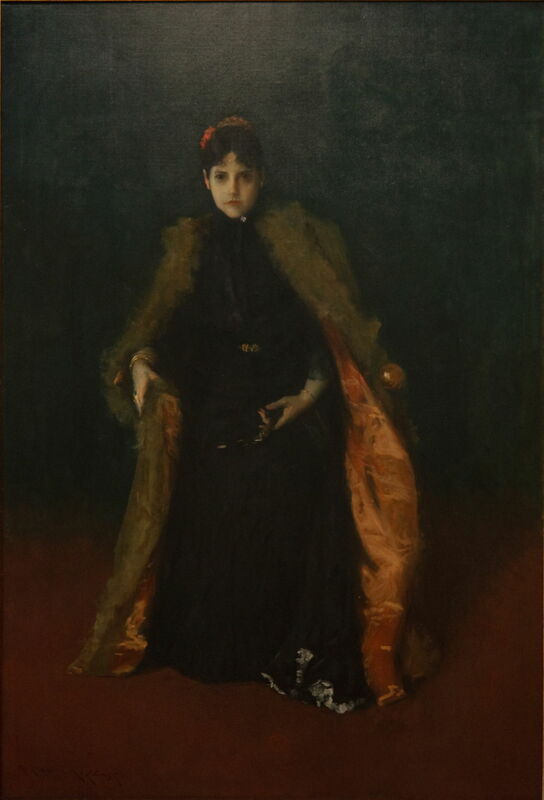 Chase gained experience of family portraiture when one of his demanding professors at the Royal Academy of Fine Arts in Munich, Karl von Piloty, commissioned him to paint his children in about 1877. He seems to have risen to that task, and to have enjoyed maintaining a pictorial record of his own family later. Chase’s wife came from an artistic family, but was not herself a visual artist. She did become a keen photographer, and appears to have kept extensive photographic records of their growing family. She was Chase’s favourite model, and appears in various roles in many of his paintings, but these are some of the portraits which he painted of her. 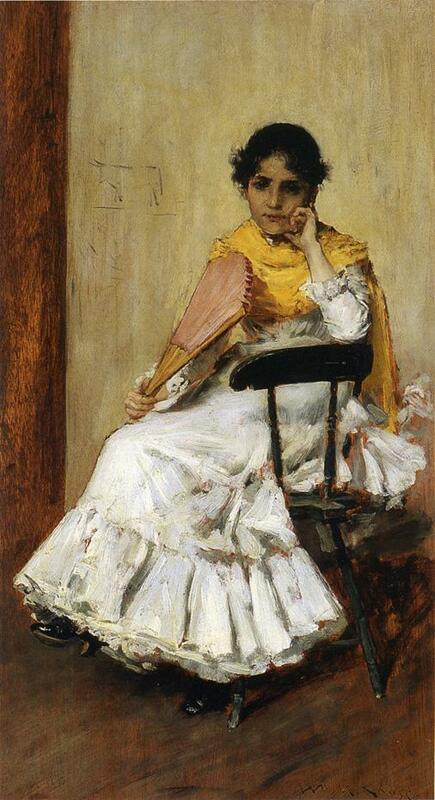 William Merritt Chase (1849–1916), A Spanish Girl (Mrs. Chase in Spanish Dress) (1886), oil on canvas, 67.9 x 38.1 cm, Wake Forest University, Winston-Salem, NC. Wikimedia Commons. 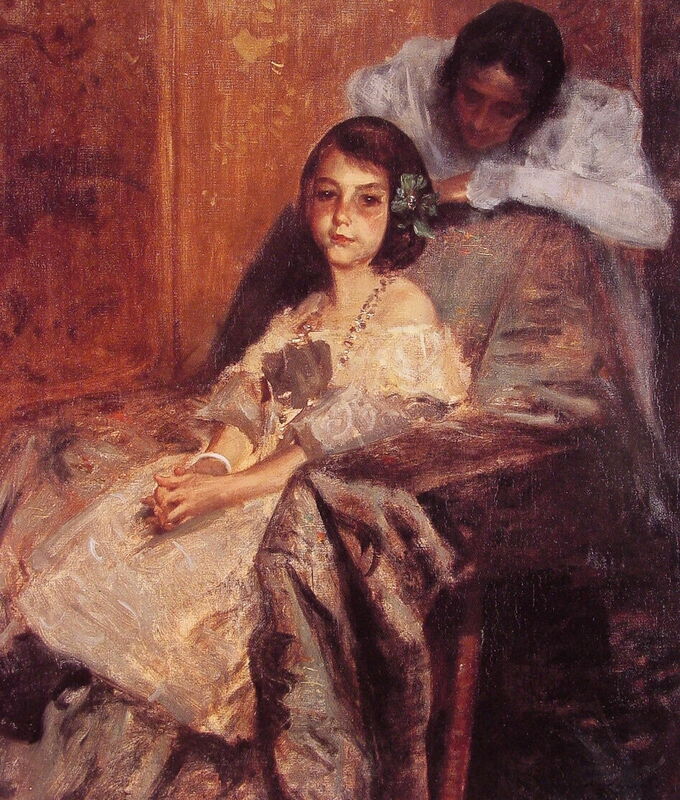 A Spanish Girl (Mrs. Chase in Spanish Dress) (1886), when she was aged 20. 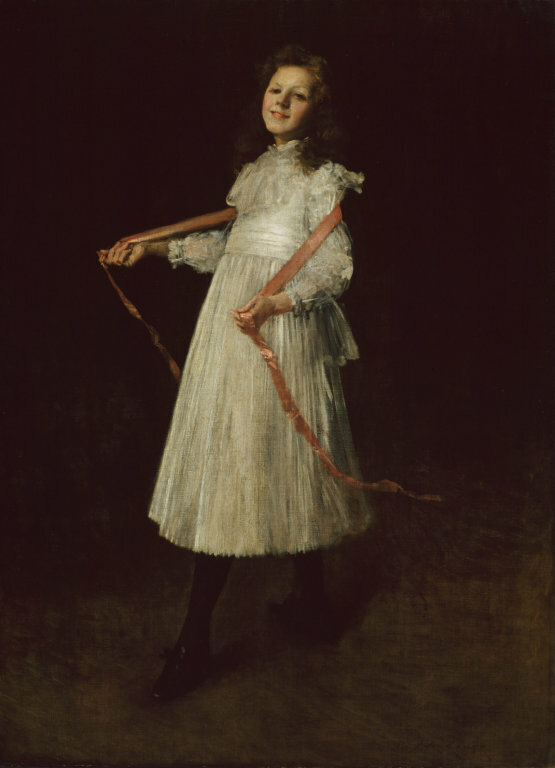 William Merritt Chase (1849–1916), The Tamborine Girl (Mrs. Chase as a Spanish Dancer) (1886), oil on canvas, dimensions not known, Montclair Art Museum, Montclair, NJ. Wikimedia Commons. 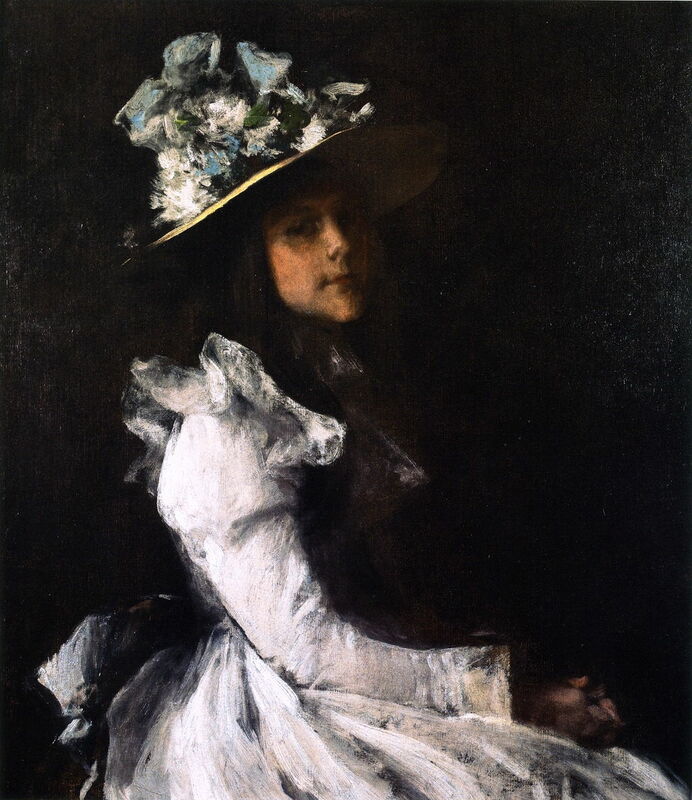 William Merritt Chase (1849–1916), Mrs. Chase (c 1890-95), oil on canvas, 183.5 x 123.2 cm, Carnegie Museum of Art, Pittsburgh, PA. Wikimedia Commons. Mrs. Chase (c 1890-95), here aged approximately 26. William Merritt Chase (1849–1916), Mrs. Chase and Cosy (c 1895), oil on canvas, dimensions not known, Sheldon Museum of Art, Lincoln, NE. The Athenaeum. Mrs. Chase and Cosy (c 1895), when the mother was aged 29, and her daughter just 8. 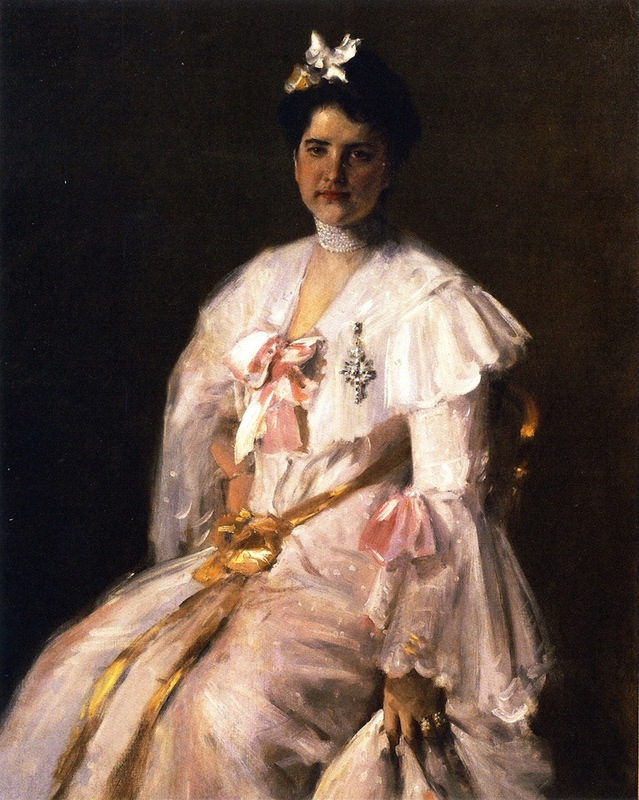 William Merritt Chase (1849–1916), Mrs. Chase (Portrait of Mrs. C.) (c 1902), oil on canvas, 121.3 x 95.9 cm, Figge Art Museum, Davenport, IA. The Athenaeum. 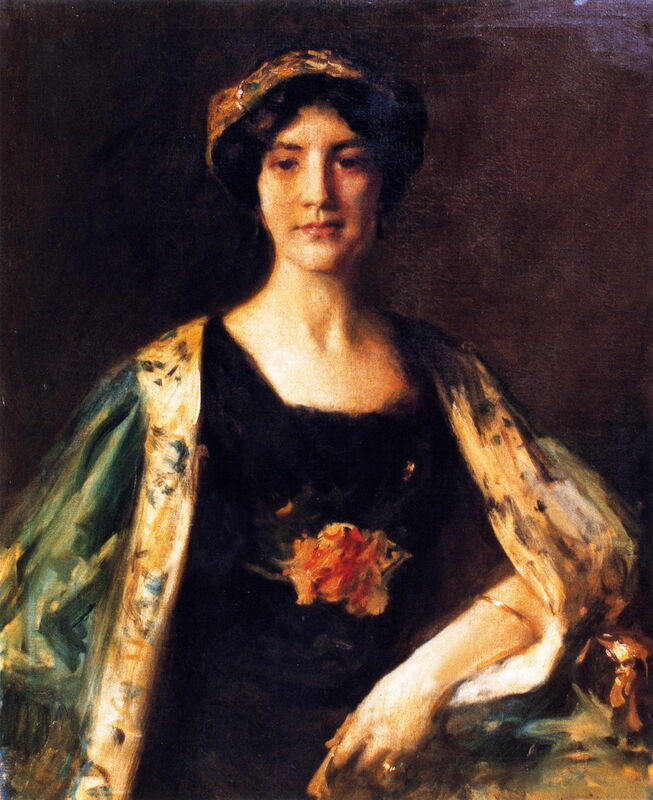 Mrs. Chase (Portrait of Mrs. C.) (c 1902), aged 36. Mrs. W.M. Chase and R.D. Chase (1916), when she was aged 50 and Roland Dana was about 16. Nicknamed Cosy, she became his favourite model as his wife’s family duties restricted her availability. William Merritt Chase (1849–1916), Alice (1892), oil, other details not known. Wikimedia Commons. Alice (1892), when aged 5. 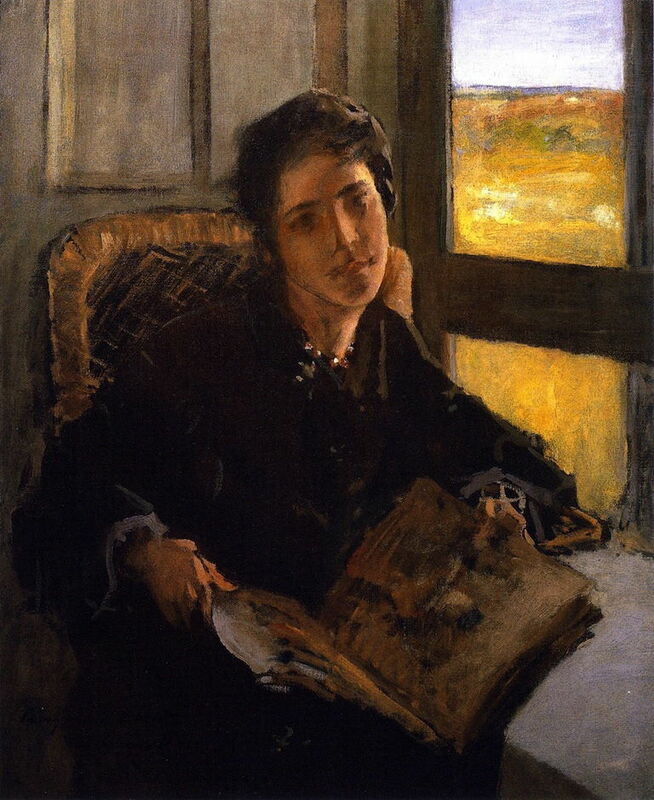 William Merritt Chase (1849–1916), Portrait of Alice Dieudonnée Chase (c 1899), oil on canvas, 95.9 × 78.1 cm, Dallas Museum of Art, Dallas, TX. Wikimedia Commons. 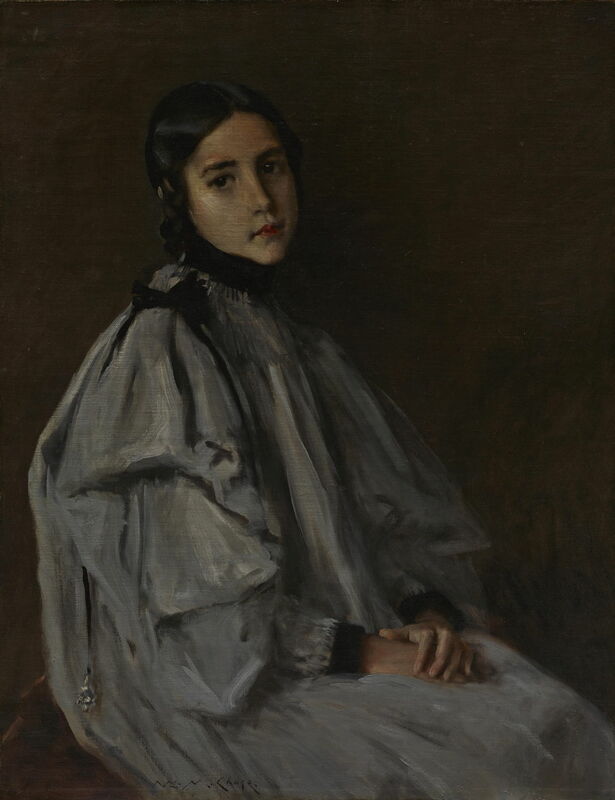 Portrait of Alice Dieudonnée Chase (c 1899), here aged 12. William Merritt Chase (1849–1916), Alice Dieudonnée Chase, Shinnecock Hills (c 1902), oil on canvas, 55.9 x 45.7 cm, Private collection. The Athenaeum. Alice Dieudonnée Chase, Shinnecock Hills (c 1902), aged 15. William Merritt Chase (1849–1916), Alice Chase Sullivan (Mrs. Arthur White Sullivan) (c 1912), oil on canvas, 91.4 x 73.7 cm, Private collection. The Athenaeum. Alice Chase Sullivan (Mrs. Arthur White Sullivan) (c 1912), now aged 25 and married. Although their second child, she does not appear much in Chase’s paintings. William Merritt Chase (1849–1916), Koto Chase (1899), oil on canvas, 76.2 x 64.8 cm, Private collection. The Athenaeum. Koto Chase (1899), when she was aged about 10. After his wife and oldest daughter, Dorothy was his next favourite model. William Merritt Chase (1849–1916), Dorothy and Her Sister (1901), further details not known. Wikimedia Commons. Dorothy and Her Sister (1901), when she was aged about 10. 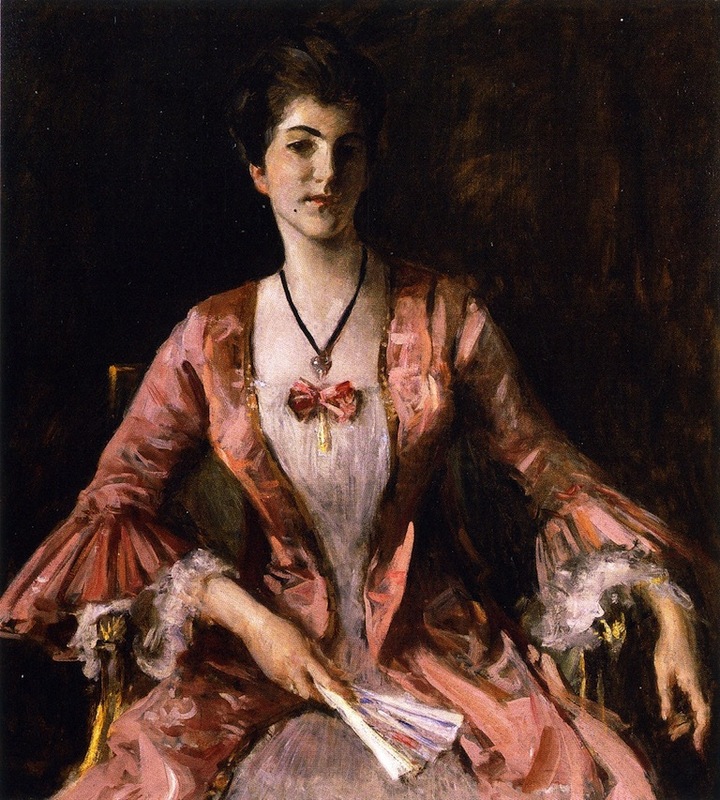 William Merritt Chase (1849–1916), Dorothy (Dorothy in Pink, Portrait of Miss Dorothy Chase) (c 1913), oil on canvas, 108 x 97.8 cm, Santa Barbara Museum of Art, Santa Barbara, CA. The Athenaeum. Dorothy (Dorothy in Pink, Portrait of Miss Dorothy Chase) (c 1913), now aged about 22. 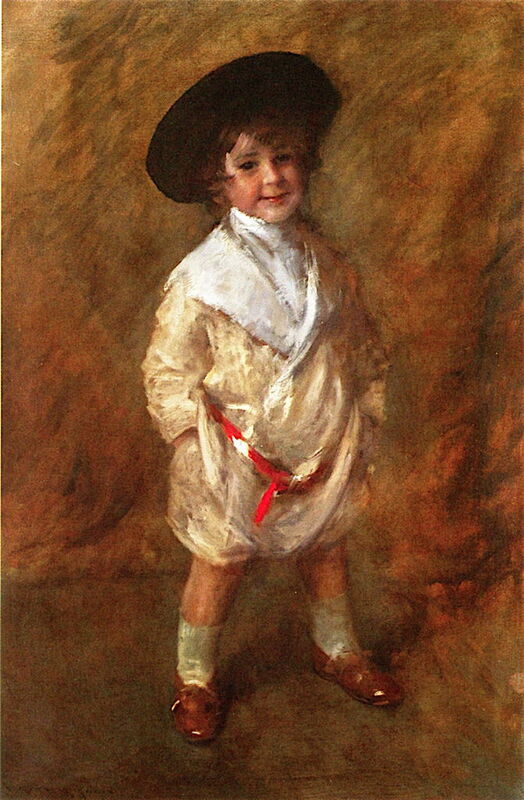 Of the two boys who survived their childhood, is was Dana, as he was known, who appeared in more paintings. Roland Dana Chase (1905), when he was aged about 5. 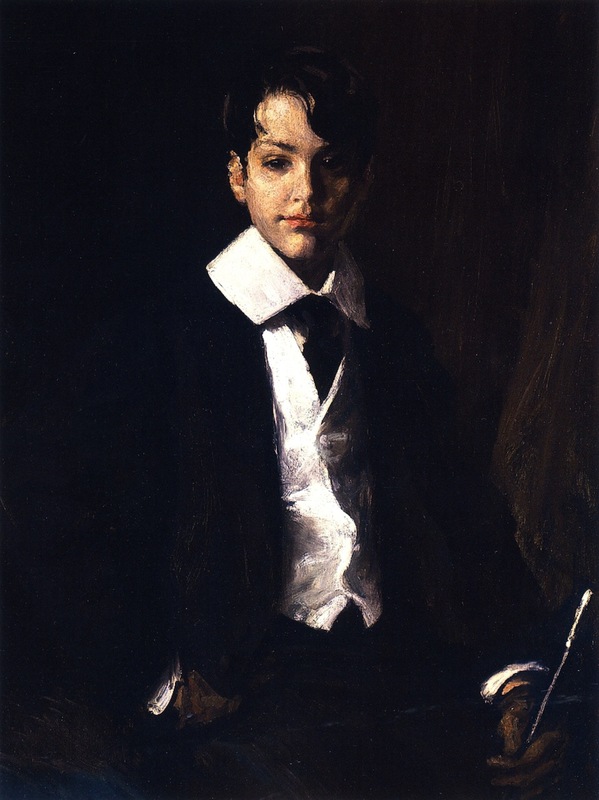 William Merritt Chase (1849–1916), Master Roland Dana Chase (1914), oil on canvas, 81.3 x 63.5 cm, Private collection. The Athenaeum. Master Roland Dana Chase (1914), when aged about 14. Hirshler EE (2016) William Merritt Chase, Museum of Fine Arts Boston. ISBN 978 0 87846 839 3. Longwell AG (2014) William Merritt Chase, A Life in Art, Parrish Art Museum and D Giles. ISBN 978 1 907804 43 4. Smithgall E et al. (2016) William Merritt Chase, A Modern Master, The Phillips Collection and Yale UP. ISBN 978 0 300 20626 5. Posted in General, Painting and tagged Chase, children, family, painting, portrait. Bookmark the permalink.